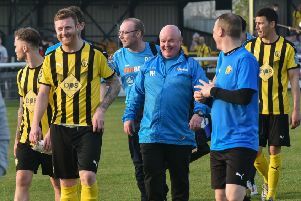 Southam United manager Lee Constable has been busy adding to his squad ahead of his team’s return to action tomorrow, writes David Hucker. With club captain Tom Cross having left for Hinckley AFC, Constable has signed Nathan Carro from Bishops Itchington as his second goalkeeper to add to Will Freeman. Another to leave is full-back Marc Passey, who has moved to Coventry United, with striker Charlie Cook expected to come in the opposite direction. “It’s disappointing to lose Crossy, but I understand his reasons and we wish him well,” said Constable. “We quickly moved in for Nathan Carro, who is one of the best keepers on the local scene and is desperate to step up and test himself. Another young player signing on is Johnny Adair, who Constable describes as “coming with a good reputation”, having played for the club’s junior teams in the past. As well as the loss of Cross and Passey, experienced defender Charlie Neale, who returned to the club this season, has had to reduce his playing time due to work commitments. After a blank Saturday last week, Saints will be back in action tomorrow when they go to Triumph in the Coventry Charity Cup. Carro is ineligible, so Freeman will be in goal but, otherwise, Constable will have a full squad to choose from. Saints resume their Midland Football League programme on Wednesday when they travel to free-scoring Nuneaton Griff.